As I kid, I was lucky. I grew up in the heyday of basketball. 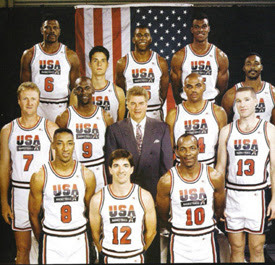 Bird and McHale, Worthy and Magic and Jabbar, Olajuwon, Drexler, Malone and Stockton. I watched as the Knicks won the lottery and took Patrick Ewing. I saw Jordan finally beat the Pistons and go to the first of his Finals. I saw Chris Mullin become the player he always could be—before alcohol took years of his talent—and finally make the original Dream Team. But that's all gone. I gave up basketball. I'm done. And apparently I'm not the only one. With waning TV ratings, and no one rising to take Michael Jordon's mantle, arenas from Milwaukee to Charlotte, Seattle to Atlanta once filled with fans, remain half-full, where they once sold out. Michael Sokolove, in his 2005 New York Times magazine piece, "Clang!" writes that the problem may stem from the decline of the quality of the game. He writes that, over the years, as the game has become more focused on the highlight reel play, the decline in basketball fundamentals has led to an inferior product, and thus, disinterested fans. With quotable line after quotable line, Sokolove writes about the MTV-ization of the game; the decline of team play in favor of individual showboating (including players forcing trades so they didn't have to share the spotlight with another star), and the rise of international players who have the team-oriented fundamental skills that American-born stars have never been taught (or who refuse to learn). To complement Sokolove's essay, I'll use one example of a play I saw recently while watching the Knicks—a play I've seen way, way way too often recently. With the Knicks down by 8 in the third quarter, they get a long rebound and start a quick 3 on 1 fast break—until Marbury stops at the 3-point line to shoot a 3. Which he misses. However, as persuasive as Sokolove as, I do think there is one place where he errs. And that is when he writes of the growing thug problem and the disconnect of NBA fans from the stars of the game. 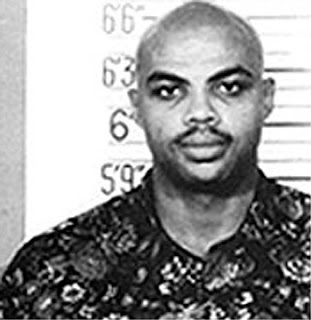 He writes, "The NBA doesn't have a thug problem; it has a basketball problem." I disagree. It has both. He is very right about the decline of the quality of basketball. The lack of fundamentals is obvious to anyone who has watched the game over the past decade or so. An example of where this is evident is exactly what Walt Frazier complained about, that is, team scoring. A quick look into it this year shows that the highest team scoring average is 107 pts a game (which is higher than it's been recently). In the 1983-1984 season, the season I really began to follow basketball, it was 122 pts a game. Stephon Marbury, the self-proclaimed "best point guard in the game" this year is shooting a 41% field goal percentage. 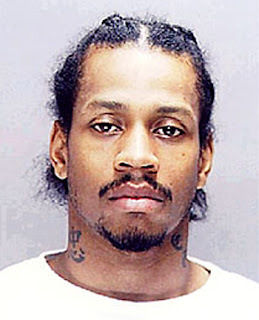 Allen Iverson's career percentage is 42%. To contrast, John Stockton's career percentage was a touch under 52%. Walt Frazier's was 49%. Watching a game destroy itself is not only frustrating; it is sadly, boring. Fundamentals I was taught in pee-wee league are spotted in NBA games exceedingly rarely. Miss after miss, dumb play after dumb play, it became tiresome to watch. But even so, that alone wasn't enough to drive me from the game I grew up loving. Last year, the NBA, in a remarkably unwise decision, decided to have their annual All-Star game in Sin City, that is, Las Vegas. The result: 362 arrests, 4 people shot. NBA thugs, hangers-on and posses rode roughshod over a city built for partying till Sin City raised a white flag. It got so bad over NBA All-Star weekend, businesses closed and lost money rather than risk the safety of their employees and livelihood. The Chief Executive of the MGM Mirage was quoted as saying he doesn't want the NBA All-Star game in town. Ever again. This despite the fact that Las Vegas has spent millions of dollars trying to draw an NBA franchise to the city. In 2004, there was the infamous brawl in Detroit where Ron Artest jumped into the stands which began a players versus fans stadium-wide brawl. A few days later, Artest appeared on TV, not to apologize, but to promote his CD. To continue, there was the recent referee betting scandal and the Knicks sexual misconduct trial. Before these, there was Latrell Sprewell choking his coach, P.J. Carlisemo, twice. The Nuggets—Knicks courtwide brawl in 2006. Kenyon Martin refusing to enter a game over a feud with Coach Karl over playing time. Robert Horry throwing a towel into the face of his coach and walking off the court. There was the Knicks-Heat playoff brawl. Scottie Pippen refusing to enter a playoff game because he wasn't getting the final shot. Sprewell, again, turning down a multimillion-dollar contract, because he has to "feed his family." And one of my favorites, Gilbert Arenas, as he was being arrested, said, “You can’t arrest me. I’m a basketball player." And there are more. These are just the ones off the top of my head. And yes, thuggery is not exclusive to basketball. All sports have thugs, and there are incidents in every sport. However, whereas there are shmucks and problem-cases in other sports, it hasn't become the culture, the norm. It hasn't become as accepted as it has in basketball. But the real reason I left basketball—and the reason I can't ever see going back—occurred earlier this decade. It was when the United States tried to organize a new Dream Team to go to Athens for the Olympics. As the Olympic committee asked player after player, they were met with refusal after refusal. Some were "too tired" (Shaquille O'Neal). Others were "concerned about security," despite the fact that 1.5 billion dollars was being spent on security and the NBA team would be staying on a ship protected by Navy SEALS. (Also, I'd like to point out, that Yao Ming, Tony Parker, Pau Gasol, Manu Ginobili, Dirk Nowitski and other foreign-born NBA stars had no fear about representing their countries even though they would not be protected by Navy SEALS.) One player, who I won't name, refused to represent his country because he wanted to be close to his NBA contract negotiations. As if there isn't a fax machine in Athens. The fact that certain players of the NBA not only didn't relish the chance to represent their country, but shirked it as some kind of burden, represents for me the ultimate in arrogance and selfishness. Can you imagine not wanting to stand on a stand with a medal around your neck as the National Anthem is being played and the flag is being raised? What about that seems a burden? In a way, this nauseating off-the-court behavior mirrors the on-the-court selfishness. I don't expect angels to play the game, I don't mind grown men enjoying the money they make. I simply want the players to love the game as I love it. Play as though you realize you are so lucky to have the talent you do—because there are millions who would give anything to play that well. Millions who would play the game for nothing. In short, I simply ask for a respect for the game, not to mention a respect for the country that allowed the opportunity to earn millions playing a game. And until that happens, I say goodbye, godbless and farewell to the game I love. What is most disturbing about the NBA is that we have a ref who was fixing games who told prosecutors he was willing to give up another 20 refs who also fix games as part of a deal to get a lighter sentence. Think about this...there could be at least 20 refs in the league who take money from organized crime families (Donaghy was working with the Gambino family, but I'm sure there are other organizations in on it) to call phantom charges on a team's superstars so they have to sit out huge chunks of games in foul trouble. If you think a ref in someone's pocket can effect the outcome of a game, think about how easily a game could be fixed if one player on the court had "extra incentive" to miss some free throws or commit stupid fouls, or throw the ball out of bounds a few times to cover a spread. I am convinced it happens, because many of these players don't care if they win or lose. One can make the argument that defense has gotten better since the 80's, and it is convincing. Starting with the Pistons of the late 80's and early 90's through Pat Riley's Knicks, a premium was put on defensive play that I had never seen before at the pro level. Rodman (who couldn't hit the broad side of a barn) was considered one of the most dominant players in the game. Jordan and Pippin were outstanding defensive players, which is tough to remember because of their unbelievable play at the other end of the floor. Even today I believe it is tougher to get to the basket than it was 25 years ago, which is part of the reason players hoist more deep jumpers. But that doesn't explain everything. NBA basketball is a big show. I don't think the players are any worse than they used to be. I think the level of talent in the NBA across the board is maybe better than ever. The athleticism in the league is astounding. While fundamentals may have slipped some, there is enough talent in the league to produce a great product out there night in and night out. These players don't care, though. I think many players are on the take. I think many don't play as hard because they know it's just a show. There are some players who play with heart and are fundamentally sound (Timmy D. comes to mind), but I think there are far more players who go through the motions because they're getting paid, one way or the other. I think a big part of the problem is the emergence of AAU and all the shady dealings with shoe companies and other sponsors that AAU has perpetuated. AAU kinds are on the road as much as college players. They get free stuff under the table all day. I think AAU puts the notion in these kids' heads that the almighty dollar is what counts. I think these young players are ruined by the time they're 13 years old. The element of breaking rules and giving "little extras" to young people has filtered all the way up to the pro level, where many players could not care less if they don't make the play-offs. And, yes, I firmly believe that many (and I mean about 10% of the players in the NBA) fix games from time to time. And it is nauseating. I'm sticking to college and pulling for mid major teams. I think there's a still a purity at that level that doesn't exist elsewhere. How can you expect people who don't respect the simple things in life, like the country or the law, to respect each other or a game. Being paid that much money for what they do they should not only know its a privilage but should suffer the consequences of abusing that privilage and be booted from the team. As for not representing the USA, they should just be shot.